Productive therapeutic change is facilitated when the therapist and client have a good therapeutic relationship, share views on salient therapeutic matters, agree on goals to enhance client well-being, and understand what they each have to do to achieve the goals of therapy. In this book Windy Dryden and Michael Neenan address the difficulties that both client and therapist bring to rational emotive behaviour therapy (REBT) when either party is resistant to change. 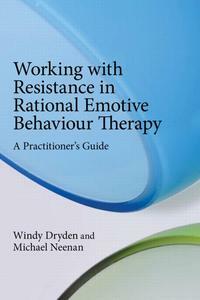 Divided into two parts, Client Resistance and Therapist Resistance, Working with Resistance in Rational Emotive Behaviour Therapy tackles the challenges experienced by both client and clinician when using REBT. Addressing issues of resistance enables both the client and practitioner to move beyond problems in the consulting room and build a more productive relationship, resulting in more effective sessions and assisting in the resolution of underlying problems for which the client has sought help. Working with Resistance in Rational Emotive Behaviour Therapy is essential reading for any practitioner hoping to use REBT more effectively in their day-to-day practice.